Are you too busy to manage Gmail email account on daily basis? Need a virtual assistant that can read, delete and send emails on your behalf from within existing Gmail account? Using Delegation feature in Gmail, you can assign any specific person or multiple users to manage Gmail account on your behalf. Other users can do all emailing tasks except changing your account password or account settings. 1. Click Gear button at upper right in your Gmail account and then click Settings to open Gmail Settings page. 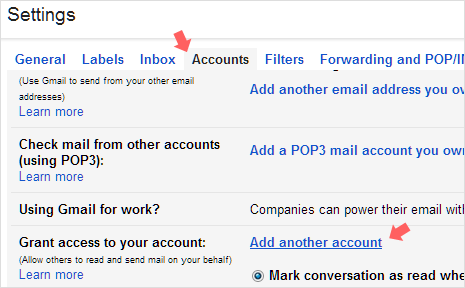 Now click Accounts tab at the top of Gmail Settings. 2. Under Accounts tab look for Grant access to your account section at the bottom and then click Add another account button next to this option. 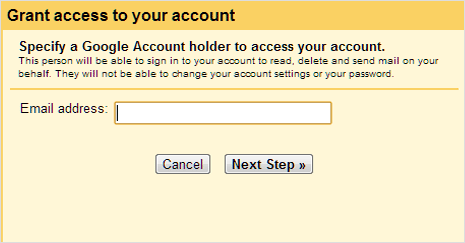 This will open a pop-up box, enter email ID (has to be Google / Gmail ID) to whom you want to grant account access. 3. Click Next Step button to continue and then you should see email message for confirmation. Click Send email to grant access if you are sure. The delegate user will receive confirmation email informing about grant of account access. 4. Whole process should be completed in 30 minutes after delegate confirms the request. You can go to Accounts tab in Setting to check latest status as to if delegate has confirmed the request. 1. Free Gmail user can add upto 10 users while Google Apps for Business, Education and Government customers can specify up to 25 users using delegation Gmail feature. There is no limit on the number of accounts a delegatee can access. 2. All email messages sent by delegated email users will have mention like From (name of actual email holder), Sent by (email of other delegated who send email on original user behalf). 3. You won’t be able to give anyone permission to change your account password or settings or chat on your behalf through this delegate feature in Gmail.